First things first, by “gift ideas for husky moms,” we of course mean the dog breed, just in case that isn’t clear! Now, on to business: if you’re looking for fun ways to celebrate your husky dog mom pride, you’ll love these ideas! 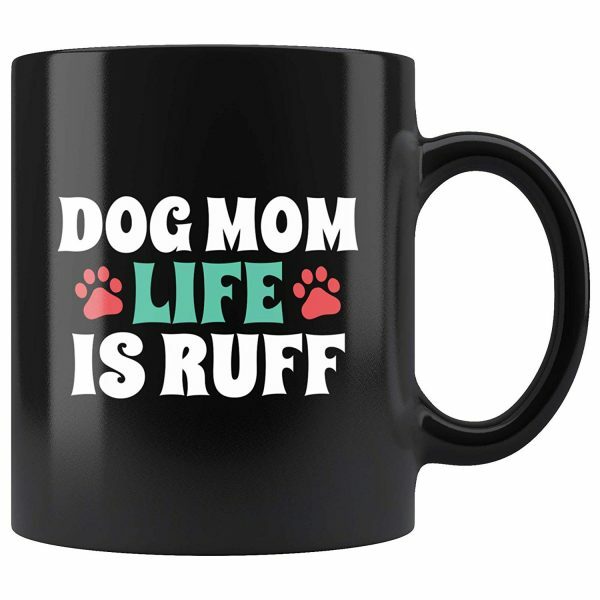 From mugs to tees, we’ve got something for everyone in our Cat Dog Gifts store! Just a couple of quick notes before we get to these fun husky dog gifts! The first five are husky-specific, while the last five are perfect for all dog moms. 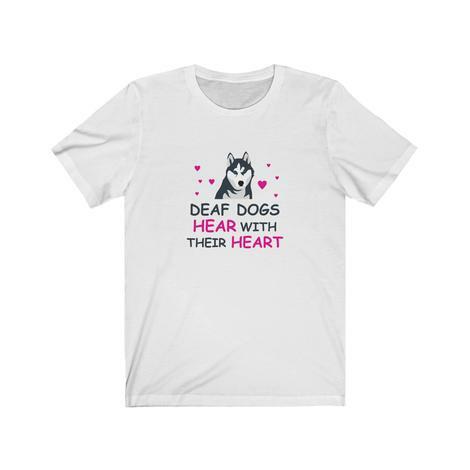 This first one is for moms of deaf huskies, and it’s such a true sentiment. 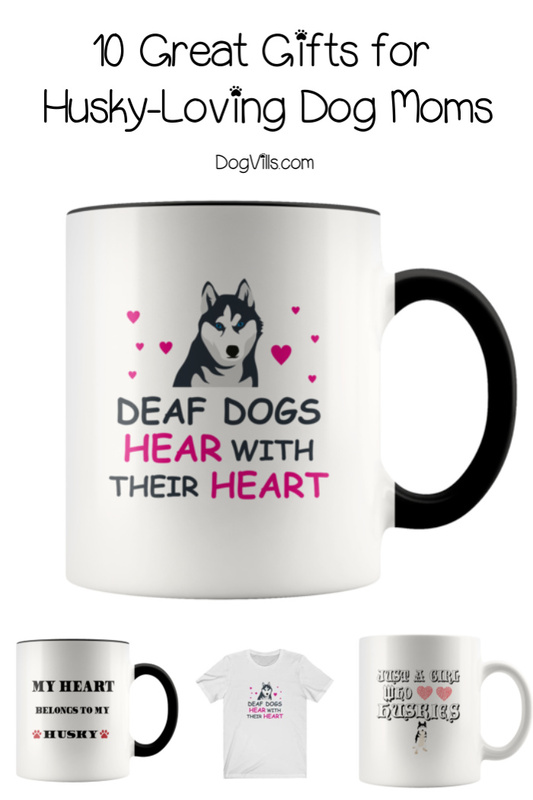 Deaf dogs really hear with their hearts and teach us how to listen with ours. 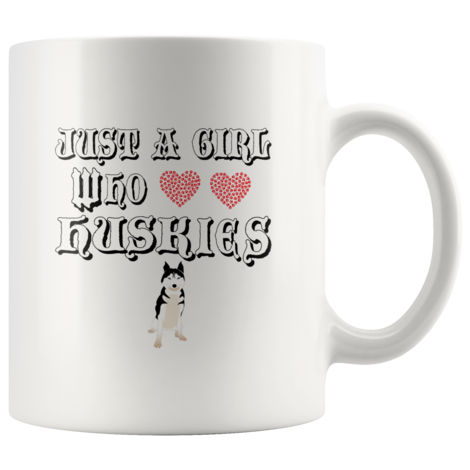 How adorable is this coffee mug for husky lovers? 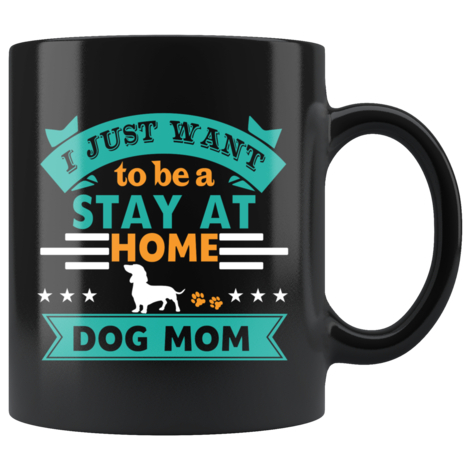 It comes on a white mug with black lettering or a black mug with blue lettering. Love this design? Check out the t-shirt further down the list! 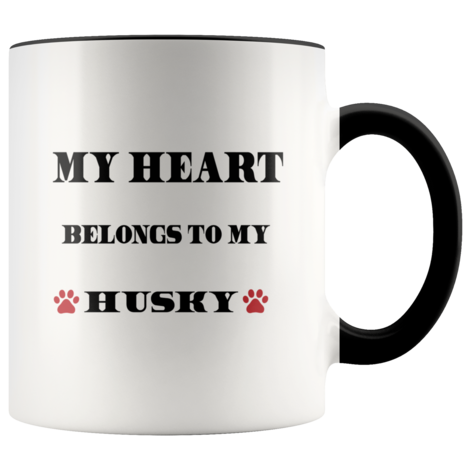 Does your heart belong to your husky? Check out this fun coffee mug! I adore our new accent handle mugs because you can get the handle in one of seven different colors. I love the black handle for this one because it just looks so classy. If you’re not loving the accent handle, though, read on for another great option. 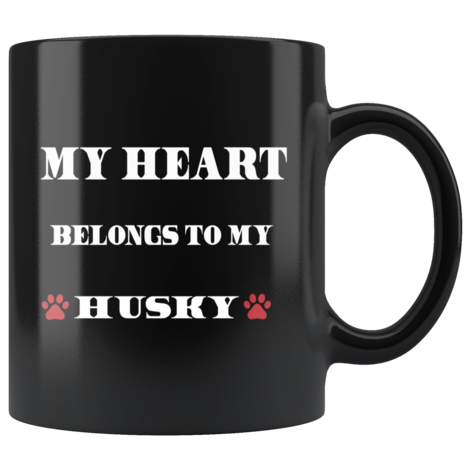 As promised, the super cute “My Heart Belongs to my Husky” saying on our black mug. As much as I adore the accent handle mugs, I do have to say that the black designs are my favorites. The words just pop right off of it, don’t they? Are you just a girl who loves her husky? 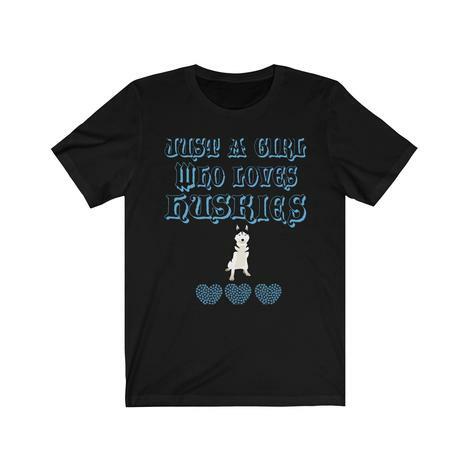 Grab this adorable t-shirt! While the weather may be horrifically cold right now, warmer days will be here before you know it! I also love buying it a size larger and layering it over a fitted white shirt. When you’re mom to a husky, you know things can get a little hairy at time (pun totally intended). Of course, I’d rather have a ruff life than a rough one any day! Fun fact: my mom grew up with a husky. One time, he dashed out the door and tried to follow her on the school bus! He actually made it on the bus! Of course, that was back before the age of leash laws and what not. 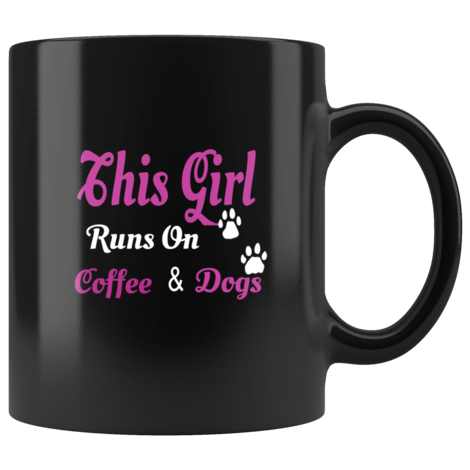 I 100% run on coffee and dogs! Cats too, but my dogs are the real driving force behind my life. Without them, I wouldn’t have the knowledge needed to write for a dog site, now would I? So, really, they help me make a living! Of course, having a high-energy dog means needing lots of coffee! All husky moms know that these active pups may completely devour your shoes, but they’ll never break your heart. The only time your dog will completely destroy your heart is the day it’s time to say goodbye. Until then, every moment is a gift! I love the fact that I can work at home. It means I have so much more time with my pups! P.S.- Don’t you just love the colors of this mug? It’s one of my favorites. Yeah, I know, I have a lot of favorites, but seriously, isn’t it gorgeous? 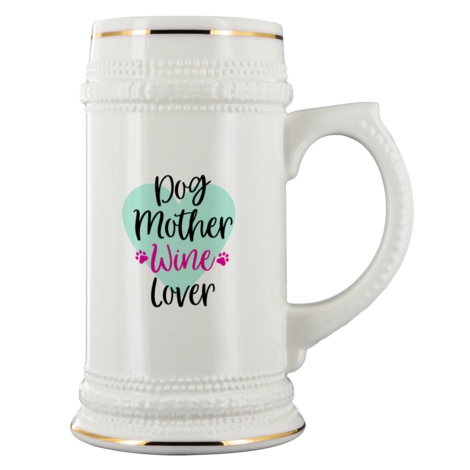 Part of our newest collection of beer steins, this one is really perfect for husky dog moms who love their nightly glass of wine! Not really a wine drinker? Don’t worry, we have plenty of other designs you’ll love. Check them out! FYI, you can drink ANY cold beverage out of these steins. It’s also available in a mug! Enter below for a chance to win 2 (two) coffee mugs of your choice from our store! 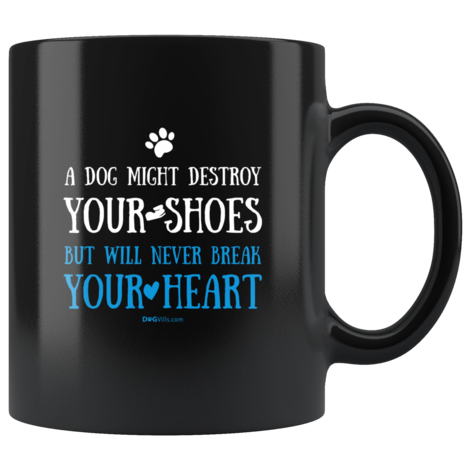 You can choose from any of our mugs, including cat and dog designs. Giveaway is open Worldwide (void where prohibited) and ends on 2/22/19. You must be 18 or older to enter. Good luck! What are your favorite gift ideas for husky moms? Share below!